Please click on the images to see larger versions. It is often said the best time to capture dramatic light is when a storm is approaching or abating. Keeping that important principle in mind, I headed out to Gas Works Park. There was wind, rain, rainbows, colorful clouds…basically, there was a lot of drama. 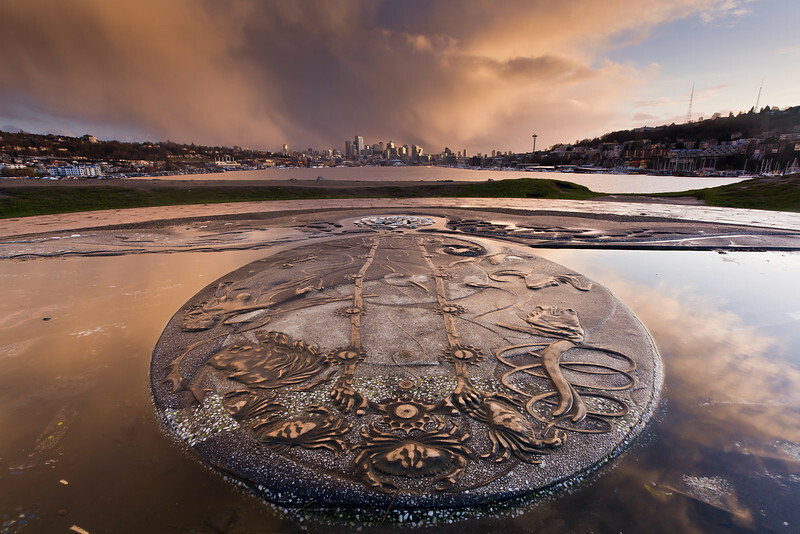 My favorite spot at Gas Works Park is on top of the grassy mound where a beautifully intricate sundial is located. After a rainy day, the sundial is frequently surrounded by shallow water, perfect for reflections. This time I was even lucky enough to encounter a friendly kite flyer. It was a cold, wet evening, but totally worth it! I hope you agree. Wow how beautiful. And a rainbow even!!!! Hey Mahesh, what beautiful pictures. 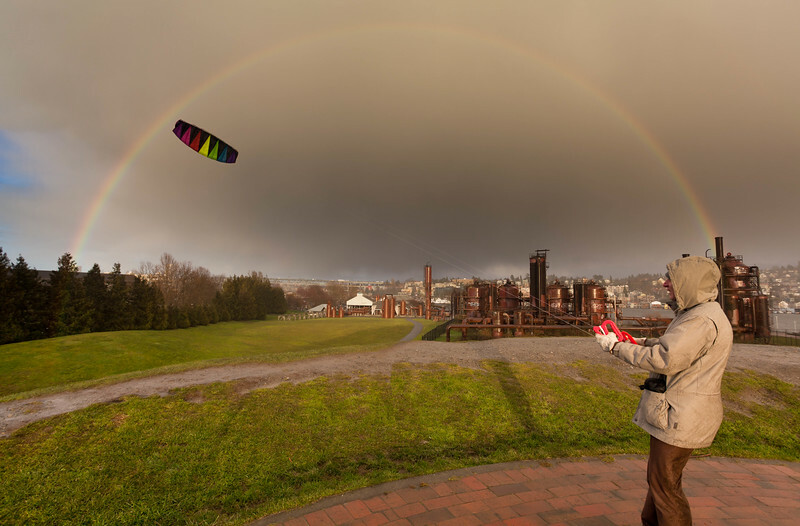 I love the rainbow and kite combination. The sundial is gorgeous! You have an incredible ability to capture moments and views that will never happen again! Love them! Thank you! You did a beautiful job with color and light. You are right to leave the birds to someone else. ooooooo love the second one so much! Thanks, everyone! What a great description, Chris…does kinda look like a medallion hanging from the city’s neck, doesn’t it!? Yes, definitely needed a steady tripod for the low light, high winds, and relatively small lens aperture (to obtain maximum depth of field).